The Mayor's proposed 2019-2020 budget, explained. 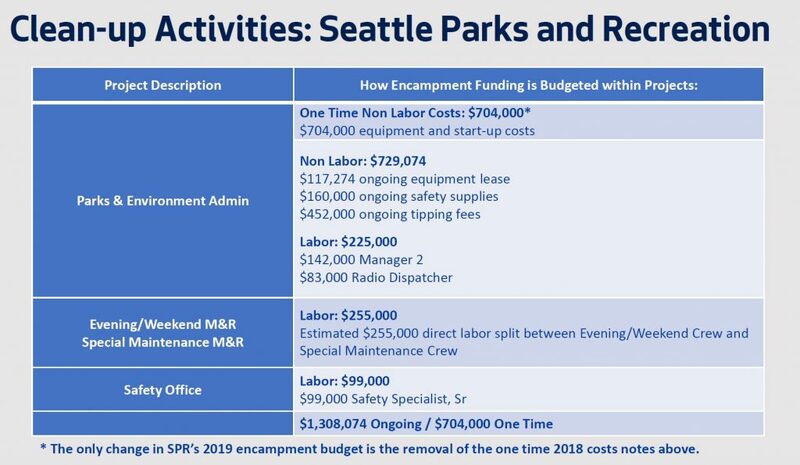 See what changes Mayor Jenny Durkan is proposing on the spending side here and the revenue side here. This story originally ran on SCC Insight. On October 3, the Mayor’s Office walked through for the City Council the parts of the proposed budget related to responding to the homelessness crisis, which span several departments. Let’s dive into the details. 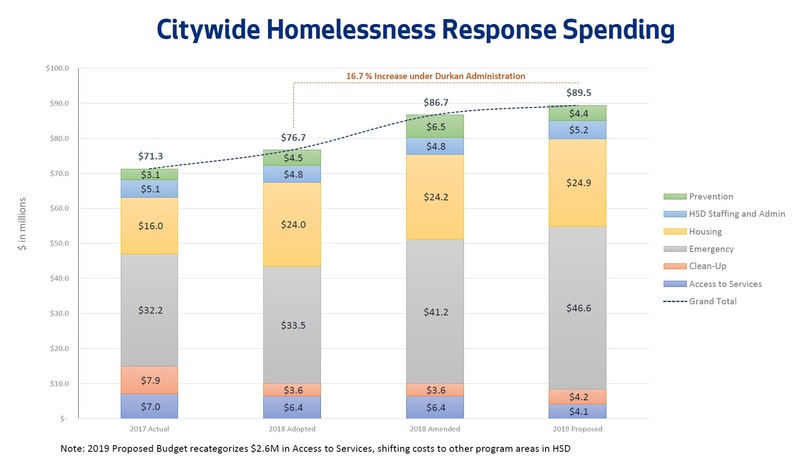 Overall, on paper it looks like the budget for the homelessness response isn’t increasing very much in 2019. In one sense that’s true; in another it isn’t. The officially approved budget for 2018 was $76.7 million (again, spread across multiple departments, with the bulk in the Human Services Department). But over the course of this year, the Mayor and City Council have increased that amount to $86.7, paid for with one-time sources of funding such as proceeds from selling surplus property. The Mayor’s proposed budget for 2019 carries forward the higher amount by allocating sustained sources of funding in place of the one-time funding. It also adds another $2.8 million of sustained funding on top of that, for a total of $89.5 million; that’s about 3.2%, close to the local inflation rate. So while we won’t see a substantial increase in services over 2018, the budget makes it possible to sustain the 2018 level into the foreseeable future. On the surface it looks like there are cuts to two areas: prevention programs, and access to services. In truth, neither is being cut. The 2018 prevention services budget included $2 million for a two-year pilot program run by the Seattle Housing Authority that provides rental housing assistance; the program is funded through 2019, but all of the money was accounted for in the 2018 budget. As for access to services, a $2.6 million “community crime prevention” program was reclassified out of the homelessness category into another division of the Human Services Department to better align it with similar youth programs — so the program still exists and is funded, but it’s no longer considered primarily a “homelessness response” program. 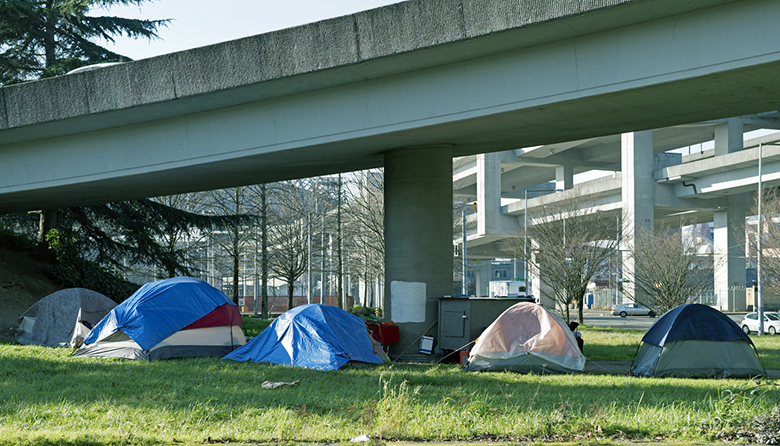 The budget allocates funding for four kinds of emergency shelter: basic shelter, enhanced shelter, permitted villages (often called “sanctioned encampments” and/or “tiny home villages”) and day shelters/hygiene centers. The city has been expanding the permitted villages; by the beginning of 2019, it expects to have nine villages with a total capacity of 328 beds. However, it recently announced that it has chosen not to renew the permit for the 50-bed village in Aurora-Licton Springs when it expires in March, in keeping with its promise to the local community to limit the duration of that site. 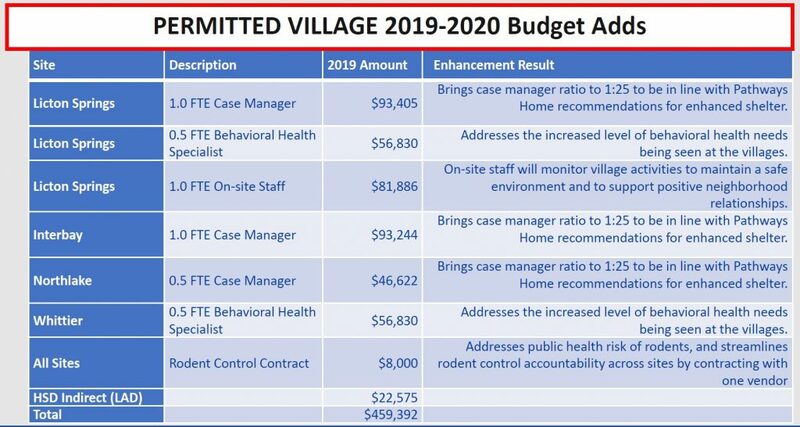 All of the current residents of the site were referred by the Navigation Team; it has stopped referring people to that village, and the 2019 budget adds additional case management resources for the village to help transition all of the current residents out by March — hopefully to permanent housing. The Mayor’s proposed budget adds additional staff to several other permitted villages as well. 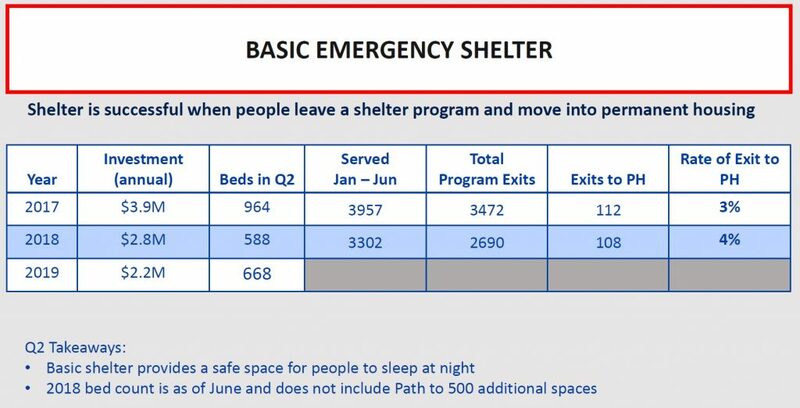 Equally controversial is the city’s strategy with “basic” shelters that only provide overnight space and often don’t have case management or hygiene services. 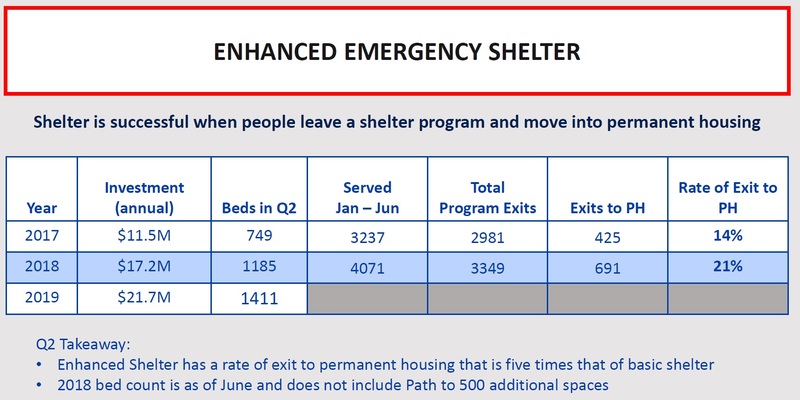 Basic shelter has been shown to have a considerably lower rate of success in moving people out of homelessness than enhanced shelters that provide 24-hour space and other supportive services. In the summer and fall of 2017, HSD re-bid out its emergency homeless services contracts through an RFP process and gave strong preference for enhanced shelters, in the process eliminating funding for some long-term providers of basic shelter (most notably SHARE/WHEEL). It also reduced funding for day centers and hygiene centers, preferring instead to spend those funds to increase enhanced shelter services that would also provide those services — and hopefully result in more exits from homelessness. The basic shelter providers — especially SHARE/WHEEL — complained loudly to the City Council, who added money to the 2018 budget to provide “bridge funding” through 2018 so there could be a smooth transition. The Mayor’s proposed budget is a complicated mess in this space. Earlier this summer Durkan announced her “Path to 500” program to add 500 more shelter beds — a mix of tiny homes, enhanced shelters, and even some basic shelter beds — before the end of the year, using one-time funds. 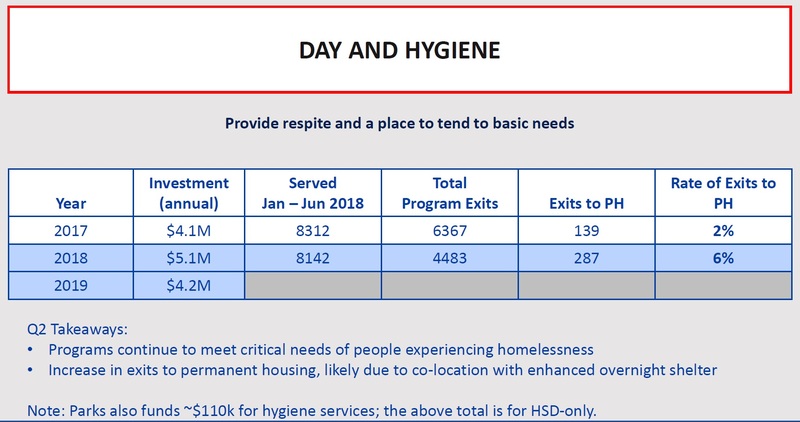 Her 2019 budget sustains those additional beds, but at the same time it doesn’t restore funding for the basic shelter providers that didn’t make the cut in last year’s RFP. HSD’s logic is that the providers that weren’t funded have been low-performing, and they want to direct funds to the organizations that are performing well. This has continued a war of words over SHARE/WHEEL’s performance. The organization has a reputation for being prickly and difficult to work with; also for its staunch opposition to performance measurements. Since at the time of the RFP it largely had refused to enter data into the HMIS system used to track providers’ performance, HSD had an incomplete view of its performance, though SHARE/WHEEL claimed that it had a much higher exit rate than other basic shelter providers. This year it has been entering data, but it still couldn’t agree with the city on its exit rate; SHARE/WHEEL claims it is 16%, while the city claimed in the Oct. 3rd Council briefing that it is 7%. In an email last Friday, a spokesperson for HSD told me that both sides were wrong: the city had omitted two of its managed sites, but SHARE/WHEEL had omitted all of WHEEL’s sites. Since they are all funded under a single contract, the city looks at all of them together, and the combined exit rate is 8%. That’s better than the average for basic shelters in Seattle (4%), but far worse than the 21% rate for enhanced shelters. 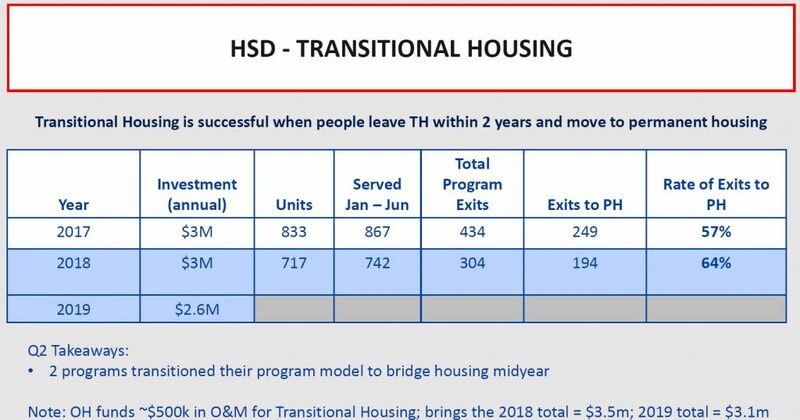 In the October 3rd briefing, HSD also noted that SHARE/WHEEL refused to write a transition plan for its basic shelters for after the city’s “bridge funding” runs out. Some Council members have already expressed concern about discontinuing bridge funding to SHARE/WHEEL as it tries to house people who are chronically homeless. some of the most challenging people to serve in the homeless community; expect that to be an issue raised in the budget deliberations. In related news, SHARE/WHEEL has announced that it will be discontinuing its management of the Aurora-Licton Springs permitted village by October 22. The Mayor’s budget continues funding for several programs to move people into housing. Transitional housing is largely sustained, though two existing programs aimed at youth have transitioned to a new “bridge housing” category. Transitional housing has been found to be particularly effective and moving youth out of homelessness. Rapid Rehousing programs have continued to see better performance and are getting a small bump up in their funding. Diversion programs, which try to catch people right at the point their are entering the homeless system and get them back into permanent housing, have also seen substantial performance improvement this year; their budget is unchanged for 2019. 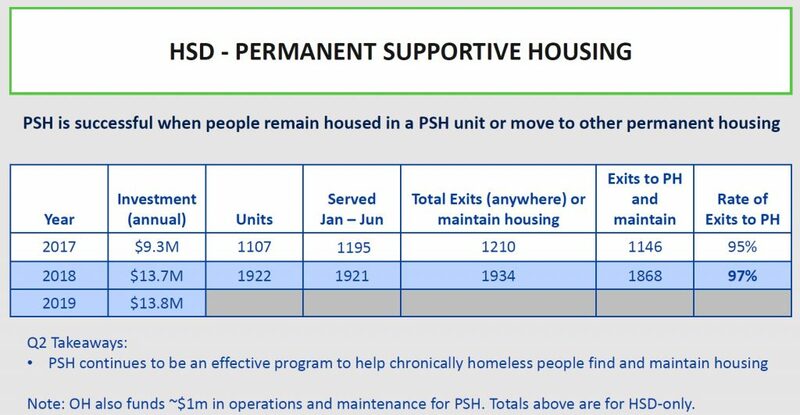 Permanent supportive housing, the most expensive form of housing in the system, which provides wrap-around services for homeless people with high needs (such as many of the chronically homeless), has continued to see high success rates and its budget is largely unchanged for 2019 as well. The Office of Housing awards grants for affordable housing projects around the city. Its one reliable source of funding is the Seattle Housing Levy; in addition, it gets money from Incentive Zoning and MHA fees paid by developers, but those sources are not predictable from year to year. It receives almost no “general fund” dollars. The Office of Housing is spending $100 million this year (including a windfall MHA payment from the Washington State Convention Center expansion), about 25% of which will go to projects specifically targeted at housing units for the homeless. The 2019 spend is currently expected to be $70-80 million, and again about 25% will target housing for the homeless. But that number could rise if the city-wide MHA is passed early next year, if the Mercer Megablock sale goes through, and/or if there are some new large development projects in the areas of the city where MHA has already been implemented. The city is also requesting (again) that the state legislature pass a new category of real estate excise tax (REET) that could be used for affordable housing. Thee has been much buzz in City Hall recently over a new “bridge to housing” model in which homeless people are housing in large tents where case workers and other support services are also provided — in many ways an enhanced shelter in a large ten.. Council members Herbold, Mosqueda and Bagshaw have been particularly vocal about pushing this model, but the executive branch is take a more cautious approach. Expect to hear more in the weeks and months to come. The Mayor is proposing to expand the Navigation Team in 2019, adding three police officers, a police sergeant, field coordinators, an operations manager, and data analysts to the team. 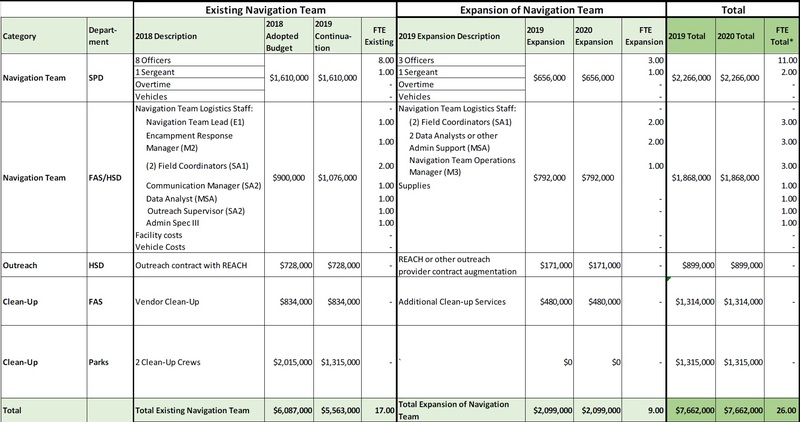 In 2018, King County provided some one-time funding for the Navigation Team; in 2019, the city is currently on its own (though the county budget is still being drawn up, and that might change). There was some discussion as to whether the Navigation Team should be adding more outreach workers. Navigation Team head Fred Podesta argued that at the moment the team is not limited by capacity of outreach workers; it’s limited by the lack of places to refer people to. Still, some of the Council members were not convinced that more police officers should be added; Council member Herbold suggested that the team should add paramedics or other health professionals instead. Look for more wrangling on this before the budget is done. The City Auditor’s Office recently published an audit of the Navigation Team. It echoed Podesta’s comment that the team is limited by places to refer people to. It also found that while the city has been making improvements in the Navigation Team’s approach, there are additional opportunities for incremental improvements. The city has $4.2 million budgeted for cleanup activities in 2019, building on what it has been doing this year. The Parks Department budget will carry over at the same level (except for one-time costs in 2018 for equipment and startup). Seattle Public Utilities will expand its three key “clean city” programs: encampment trash pickup, litter abatement, and needle collection. 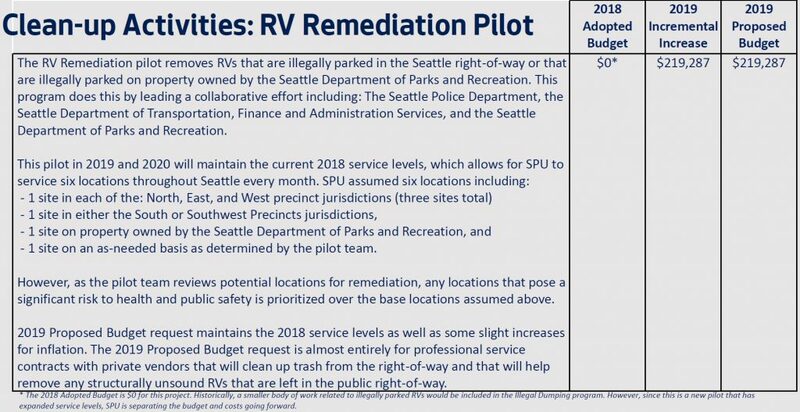 In addition, the city is budgeting $219,000 for a pilot program partnering with the police department to deal with clusters of RVs that create large collections of garbage and human waste. Some Council members expressed varying concerns: Herbold that it isn’t enough to make a meaningful difference (especially in her district), Bagshaw and O’Brien that they need to find places for the RVs to go rather than just push them around the city, and Gonzalez that the program isn’t partnering enough with HSD to create outreach opportunities to offer services to homeless people. The Mayor’s proposed budget has no bold new ideas, and no substantially greater funding, for addressing homelessness. It does ensure that strides made in 2018 will continue forward, including her “Path to 500” initiative to create more emergency shelter space as well as the incremental performance improvements in several key programs serving the homeless. This week, the Council begins the next phase of its budget deliberations, as it starts to discuss specific changes to the Mayor’s proposal. The lack of big steps forward in the Mayor’s homeless budget is clearly a cause for concern among several Council members; it will be interesting to see how they decide to address that given the lack of new revenues. They also must wrestle with how to address specific cuts to providers they are politically close to; for example, the Seattle Human Services Coalition has published its annual “recommendation portfolio,” asking the city to fund specific programs (largely run by the coalition’s own members). As the Council members head into a re-election year they will need to decide how much effort to put into delivering funding for their political allies. At 37 percent, state taxes on pot are the highest in the country. Ten of the state's 29 tribes have negotiated compacts with Washington state. Plus, the council resolves three outstanding issues.